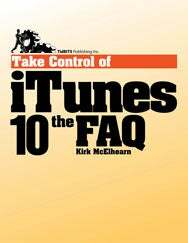 Editor’s Note: The following article is an excerpt from Take Control of iTunes 10: The FAQ, a $10 electronic book available for download from TidBITS Publishing. The 146-page ebook goes well beyond the tips in this article to answer 100 frequently asked questions about iTunes, helping readers understand the process of adding media to iTunes, tagging it, adding album artwork, and organizing it into playlists. With that setup completed, you can enjoy your music, movies, audiobooks, ebooks, and more without hassles when it’s time to find a particular item or you want to do something special like sync a select subset of music to your iPod, create a party playlist, identify music you haven’t heard in a while, or listen to the chapters in an audiobook in the proper order. How do I share my iTunes library over a network? Sharing a library is easy, but you first must turn this feature on. There are a couple of settings you need to look at in the iTunes preferences, and after that, iTunes does the rest. You can share your library only over a local network—within your home, office, or dorm. But by doing so, you let others listen to your music, and, in exchange, if they share their libraries, you can listen to theirs. If two computers are authorized with the same iTunes Store account, you can also view videos pur¬chased from the iTunes Store, and listen to audiobooks purchased there. You cannot, however, listen to audiobooks purchased from Audible when sharing your library. 1. In the General pane of the iTunes preferences, enter a name for your library in the Library Name field. 2. Click Sharing in the toolbar to open the Sharing pane. 3. By default, “Look for shared libraries” is checked, so your copy of iTunes will search on your local network for other available libraries. But you need to share your library. To do this, check the “Share my library on my local network” checkbox. 4. Select a radio button to share your entire library or to share only certain playlists. Playlists, here, includes not only regular and smart playlists, but also what I call “libraries”: Music, Movies, TV Shows, etc. You can therefore choose to share, for example, only music, but not videos or podcasts. 5. If you don’t want just anyone to access your library, check the “Require password” checkbox and enter a password. On other computers on your local network, in iTunes, your library should appear under the Shared category in the sidebar. If it does not, in those other copies of iTunes, open the iTunes Sharing preferences, and verify that the “Look for shared libraries” checkbox is enabled. How do I access someone else’s iTunes library? If iTunes is looking for shared libraries—which it does by default and which I described just previously—and finds any on your local net¬work, you’ll see a Shared section in the iTunes sidebar, showing any available shared libraries. You’ll see the names of any shared libraries that iTunes has spotted on your network in the Shared section of the sidebar. To load a shared library, just click on it. It may take a while to load, if it’s large and if you don’t have a lot of bandwidth. You can also click a disclosure triangle beside the name of the shared library to see its playlists. This includes the Music, Movies, TV Shows, etc. items and any regular or smart playlists the user has created. To play music, just choose what you want to hear by drilling down in the Column Browser (to choose, say, an album), or by selecting a playlist in the sidebar. Double-click a track to start listening. From then on, playing back content is the same as from your own library. How do I create a centralized music server and share it with iTunes Library Sharing? Here’s the idea: you have one computer with a huge hard disk, and you rip or copy all your music to that computer. You create playlists in iTunes on that computer, and you plug it into your network. Other computers on the same local network can run iTunes with nothing in their music libraries, accessing all the playlists on the main computer. If you know the basics of networking, think of that main computer as your server, and you’ll immediately understand the principle. Each other computer, each client, accesses the digital music from the server and plays it using the sharing technique I described in the previous topic. You can have several computers all streaming music from the same server—as long as your network has enough bandwidth—all at the same time. You can stream videos too, but if several people do so at the same time, it might overwhelm your bandwidth. You can also stream to a stereo or an Apple TV, as I discuss elsewhere in the book. Note: If you want to sync an iOS device, you must perform the syncing from the “server” computer; you can’t sync music from a shared library.